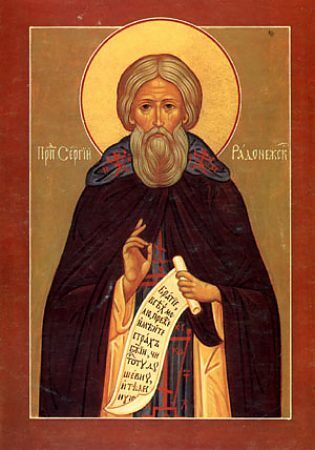 The Monk Sergei of Radonezh was born in the village of Varnitsa, near Rostov, on 3 May 1314. His parents were the pious and illustrious boyar-nobles Kirill and Maria. The Lord forechose him while still in his mother's womb. In the Vita of the Monk Sergei it reports, that at Divine Liturgy even before the birth of her son, Righteous Maria and those praying heard the thrice-repeated cry of the infant: before the reading of the Holy Gospel, during the time of the Cherubim hymn, and when the priest pronounced: "Holy Things to the Holy". God gave Kirill and Maria a son, whom they named Bartholomew. From his very first days of life the infant amazed everyone by his fasting, on Wednesdays and Fridays he would not accept milk from his mother, and on other days, if Maria used oil in the food, the infant likewise refused the milk of his mother. Noticing this, Maria refrained altogether from food with oil. At seven years of age Bartholomew was sent to study together with his two brothers – his older brother Stefan and his younger brother Peter. His brothers learned successfully, but Bartholomew fell behind in his studies, even though the teacher gave him much special attention. The parents scolded the child, the teacher chastised him, and his fellow-classmates made fun of his lack of comprehension. Finally in tears Bartholomew besought of the Lord to grant him the bookish understanding. One time his father sent Bartholomew out after the horses in the field. Along the way he met an Angel sent by God under the guise of appearance of a monk: the starets-elder stood at prayer beneathe an oak amidst the field. Bartholomew approached him, and bowing, waited for the elder's finish of prayer. That one blessed him, gave him a kiss and asked, what he wanted. Bartholomew answered: "With all my soul I want to learn reading and writing, holy father, pray for me to God, that He help me to become literate". The monk fulfilled the request of Bartholomew, raising up his prayer to God, and in blessing the lad he said to him: "From henceforth God giveth thee, my child, to understand reading and writing, and in this wilt thou surpass thy brothers and peers". With this the elder took forth a vessel and gave Bartholomew a portion of prosphora-bread: "Take, child, and eat, – said he. – This is given thee as a sign of the grace of God and for the understanding of Holy Scripture". The elder wanted to depart, but Bartholomew asked him to visit at the home of his parents. His parents received their guest with joy and offered him their hospitality. The starets answered, that first it is proper to partake of spiritual nourishment, and he bade their son to read the Psalter. Bartholomew began harmoniously to read, and his parents were amazed at the change that had happened with their son. In parting, the elder prophetically predicted about the Monk Sergei: "Great shalt be your son before God and the people. He shalt become a chosen habitation of the Holy Spirit". After this the holy lad read without difficulty and understood the contents of books. And with an especial fervour he became immersed in prayer, not missing a single Divine-service. Already in childhood he imposed upon himself a strict fast, he ate nothing on Wednesdays and Fridays, and on the other days he sustained himself on bread and water. In about the year 1328 the parents of the Monk Sergei resettled from Rostov to Radonezh. When their older sons married, Kirill and Maria shortly before their death accepted the monastic schema at the Khot'kov monastery of the Protection of the MostHoly Mother of God, not far from Radonezh. And later on, the older brother Stefan as a widower accepted monasticism at this monastery. Having buried his parents, Bartholomew together with his brother Stefan withdrew for wilderness-dwelling into the forest (12 versts from Radonezh). At first they made cells, and then a not-large church, and with the blessing of metropolitan Theognost, it was consecrated in the Name of the MostHoly Trinity. But soon, unable to bear the difficulties of life in the wilderness, Stefan left his brother and went on to the Moscow Theophany monastery (where he became close with the Monk Alexei, afterwards Metropolitan of Moscow – Comm. 12 February). Bartholomew on 7 October 1337 accepted tonsure into monasticism from hegumen Mitrophan, taking the name of the holy Martyr Sergios (Comm. 7 October), and he set about the start of a new habitation to the glory of the Life-Originating Trinity. Suffering temptations and demonic apparitions, the Monk Sergei advanced from strength to strength. Gradually he became known to other monks, seeking his guidance. The Monk Sergei accepted all with love, and soon in the small monastery were gathered a brethren of twelve monks. Their experienced spiritual guide distinguished himself by an extraordinary love for work. With his own hands he built several cells, he carried water, he chopped wood, baked bread, sewed clothing, prepared food for the brethren and humbly took on other tasks. The Monk Sergei combined the heavy work with prayer, vigil and fasting. The brethren were amazed, that with such severe exertion the health of their guide did not deteriorate, but rather became all the more hearty. It was not without difficulty that they implored the Monk Sergei to accept being hegumen over the monastery. In 1354 the Volynsk bishop Athanasii consecrated the Monk a priest-monk and elevated him to the dignity of hegumen. Just as before at the monastery, monastic obediences were strictly fulfilled. With the expansion of the monastery grew also its needs. Often the monks had only scant food, but through the prayers of the Monk Sergei unknown people provided the necessities. Reports about the exploits of the Monk Sergei became known even at Constantinople, and Patriarch Philotheos sent to the Monk a cross, a "paraman" [or "paramandia" – a monk's article of clothing, a four-cornered cloth tied with cords to the chest and worn beneathe other garb, and adorned with symbols of the Lord's Passion] and schema-robe in blessing for new deeds, and a grammota-document of blessing, in which the patriarch counselled the chosen of God to organise a coenobitic (life-in-common) monastery. The Monk set off with the Patriarchal missive to Saint Alexei, and received from him the counsel to introduce a strict manner of life-in-common. The monks began to grumble at the strictness of the monastic ustav-rule, and the Monk Sergei was compelled to forsake the monastery. At the River Kirzhach he founded a monastery in honour of the Annunciation of the MostHoly Mother of God. Matters at the former monastery went quickly into disarray, and the remaining monks recoursed to Saint Alexei, that he should get the saint to return. The Monk Sergei unquestioningly obeyed the sainted-hierarch, and left in place of himself at the Kirzhachsk monastery his disciple, the Monk Roman. Already during his lifetime the Monk Sergei had been vouchsafed a graced gift of wonderworking. He resuscitated a lad, at a point when the despairing father had given up on his only son as lost. Reports about the miracles worked by the Monk Sergei began quickly to spread about, and the sick began to come to him, both from the surrounding villages and also from remote places. And no one left from the Monk without receiving healing of infirmities and edifying counsel. Everyone gave glory for the Monk Sergei, and reverenced him on an equal with the ancient holy fathers. But human glory did not hold allure for the great ascetic, and as before he remained the example of monastic humility. One time Sainted Stephen, Bishop of Perm (Comm. 27 April), – who deeply revered the Monk Sergei, was on journey from his diocese to Moscow. The road-way passed off eight versts distant from the Sergiev monastery. Intending to visit the monastery on his return trip, the saint stopped, and having recited a prayer, he bowed to the Monk Sergei with the words: "Peace be to thee, spiritual brother". At this instant the Monk Sergei was sitting at refectory-meal with the brethren. In reply to the blessing of the sainted-hierarch, the Monk Sergei rose up, recited a prayer, and made a return blessing to Saint Stephen. Certain of the disciples, astonished at the extraordinary action of the Monk Sergei, hastened off to the indicated place, and became convinced of the veracity of the vision. Gradually the monks began to witness also other similar actions. One time during Liturgy an Angel of the Lord served together with the Monk, but the Monk Sergei in his humility forbade anyone to tell about this before the end of his life on earth. The Monk Sergei was connected with Saint Alexei by close bonds of spiritual friendship and brotherly love. Sainted Alexei in his declining years summoned the Monk Sergei to him and besought him to accept to be Russian Metropolitan, but Blessed Sergei in humility declined to be primate. The Russian Land at this time suffered under the Mongol-Tatar Yoke. Having gathered an army, Great-prince Dimitrii Ioannovich Donskoy went to monastery of the Monk Sergei to ask blessing in the pending struggle. The Monk Sergei gave blessing to two monks of his monastery to render help to the great-prince: the schema-monk Andrei (Oslyaba) and the schema-monk Aleksandr (Peresvet), and he predicted the victory for prince Dimitrii. The prophecy of the Monk Sergei was fulfilled: on 8 September 1380, on the feastday of the Nativity of the MostHoly Mother of God, Russian soldiers gained a total victory over the Tatar hordes at Kulikovo Pole (Kulikovo Field), and set in place the beginning of the liberation of the Russian Land from the Mongol Yoke. During the time of the fighting the Monk Sergei together with the brethren stood at prayer and besought God to grant victory to the Russian forces. For his angelic manner of life the Monk Sergei was granted an heavenly vision by God. One time by night Abba Sergei was reading the rule of prayer beneathe an icon of the MostHoly Mother of God. Having completed the reading of the canon to the Mother of God, he sat down to rest, but suddenly he said to his disciple, the Monk Mikhei (Comm. 6 May), that there awaited them a wondrous visitation. After a moment the Mother of God appeared accompanied by the holy Apostles Peter and John the Theologian. Due to the extraordinary bright light the Monk Sergei fell down, but the MostHoly Mother of God touched Her hands to him, and in blessing him promised always to be Protectress of his holy monastery. Having reached old age, and foreseeing his own end six months beforehand, the Monk summoned the brethren to him and blessed as hegumen his disciple the Monk Nikon (Comm. 17 November), who was experienced in the spiritual life and obedience. In tranquil solitude the Monk reposed to God on 25 September 1392. On the eve beforehand the great saint of God summoned the brethren a final time and turned to them with the words of last-instruction: "Brethren, be attentive to yourselves. Have first the fear of God, purity of soul and love unhypocritical...".